Tomato Soup Cake - Do You Know The Muffin Man? Notes: I accidentally bought a can of tomato soup on Friday, so I found this unconventional way to make use of it. The recipe is quite basic, the only thing I did differently was to add the soup alternately with the flour mixture. Also, most of the cakes and loaves I make use butter, so it was a change to use (trans-fat free) shortening this time. It's true, you don't taste tomato at all, you just see its colour. 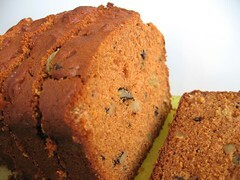 While there's nothing wrong with this fruit-nut-spice loaf, I doubt I'd buy a can of soup just to make it again.